This a quick tutorial on lighting in Bryce. It starts with the light setup I created using the settings from the default lights in Poser. It’s not a definitive guide and is certainly not very detailed. However, I hope it gets you started on using lighting successfully in Bryce to simulate radiosity and soft shadows. 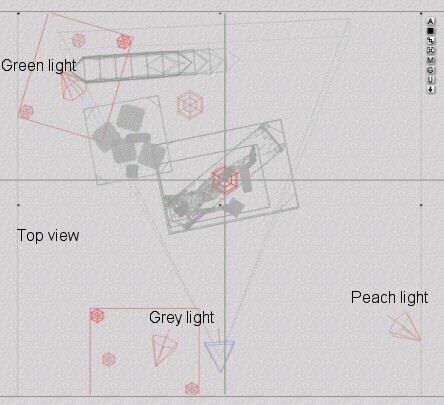 Download the light setup (Bryce 4). Set up your scene first and save. 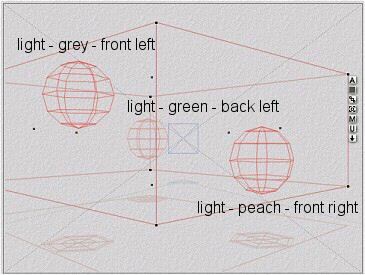 Merge the scene with the light setup scene. For this scene (for my February images), I have one figure, so I moved the light grouping as shown below. The green light should always go behind the figure. 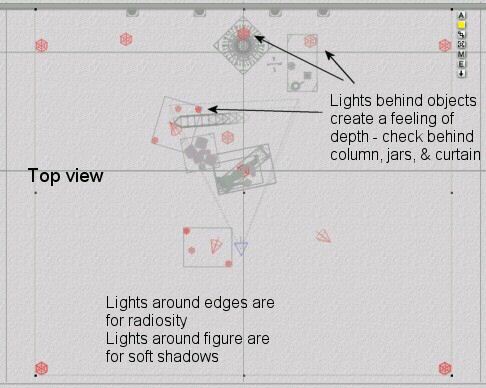 This sheds some light behind the figure giving it depth as the light flows around the sides of the figure. 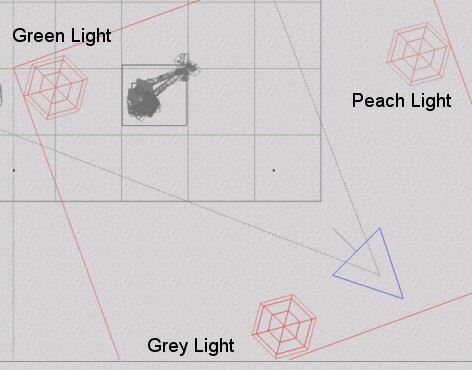 The peach and gray lights need to be in front of the figure. Move the lights farther away, adjust the intensity of the lights, and the light falloff as needed. Once you have the basic lights set up, add radiosity lights. Create a radial light place it in the corner of the room halfway between the floor and the ceiling. Duplicate the light three times and move each one into the other three corners. Adjust the intensity and falloff of each light. You don’t want the light to glare off the walls, so make sure that they are far enough away from the walls to not do this, but close enough to shed some light on the situation. Oh, for this image, i converted the lights from my light setup grouping from radials to spotlights. You’ll also notice that this is an entirely different scene than the previous image. 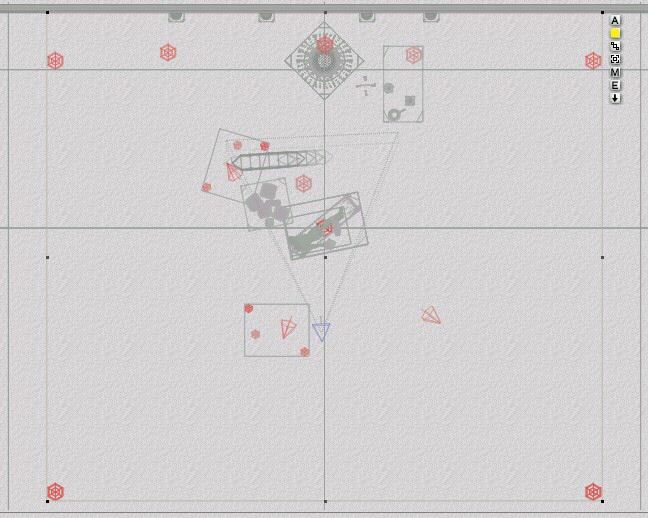 This is the wireframe view of my May image. Click on the image to view a larger version. You’ll also need at least one light at ceiling level and one near the floor for radiosity. Since this was a fairly close up image of the figure, I only have one above the figure and one lower, near the floor. Once the radiosity lights are added and you are fairly happy with them, it’s time to add the light clusters for soft lighting. If you look at the image below and check it against the one above, you’ll see that I clustered three radial lights around the green and grey spotlights. Each radial in the cluster is a shade of gray (208,208,208), but each have a different light intensity. All lights used linear falloff, but with shadows disabled. If I had used more lights in the clusters (a la Tony Seymour), I would have left the shadows enabled. Due to file size, I let the spotlights cast the shadows and the radials soften them. What, you may ask, and I know you did, is the difference between using the Poser light setup in Bryce and just using plain white radials/spotlights? Well, I’ll show you. Below are two renders of the same image with no post-processing (i.e., adjusting color, contrast, etc.). The first image uses my Poser light setup but with the colors set to white. The second image uses the colored lights. Click here for the final image used for this tutorial – May (link will be updated when image is re-uploaded to the galleries.